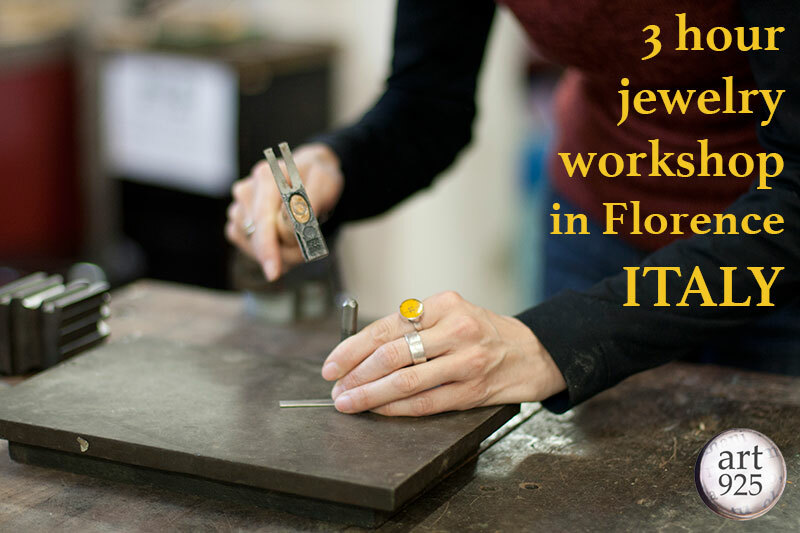 Have you ever considered coming for Florence, Italy, to study the art and craft of making jewelry in metal by hand? Inquire about having private jewelry lessons or workshops from one person minimum to 8 maximum. Bespoke courses can vary from 3 hours to 3 months, based on personal needs and requests. I have been teaching these courses for 15+ years in a studio not far from the Santa Maria Novella train station. Contact for more information. Basic and intermediate fabrication (construction) techniques can be taught. See the 20/40 hour course proposal for beginning jewelers below, and an example of a 2-day course, an example of a 20-hour course, or an example of a 40-hour course. The course is designed to give basic to intermediate practical experience in the design and fabrication of contemporary and traditional jewelry, and to develop manual and creative skills. The course aims to give a solid foundation in workshop practice and to introduce the students to workshop safety, use of tools and materials. Emphasis is placed on both design and craftsmanship. Students should know that jewelry-making needs time, patience, attention, precision and a passion for creating new forms. There are no pre-requisites for a beginning level course, but drawing, design, and 3-D experience will help. Informal discussion and critique of student’s projects. Instructor’s evaluation of completed projects. Design and creativity, originality, etc. Craftsmanship, technical competence in realizing an idea. Exercises in design transfer, cutting, drilling, piercing, filing, sanding, and buffing (polishing). A small non-soldered project using the above skills and a rivet (projects may be pendants, key chains, book decorations, etc.). Will include demo in metal textures and patinas. The design and fabrication of a Ring (straight or convex) with a cabochon stone in a bezel setting. Married metals or simple chain. (Optional project to be discussed with Instructor). The students select their projects in consultation with the instructors. Previous experience in metalwork and jewelry is taken into consideration with the planning of each program. Slides or photographs of work are needed to establish the level of experience and what projects may be excluded from a student’s program.